Maver Mega Match This qualifier number eleven (11) saw a return to the beautiful Maver Hayfield Lakes complex in Doncaster. The ‘King of Hayfield’ 3-day festival preceeding this latest qualifier produced some fantastic results with much of the field staying on to fish this second qualifier at the venue. Although many of the competitors, particularly those that had fished the festival running up to this event felt that Island Lake would produce some big weights and the overall winner, a combination of pressure on the water as well as a change in the weather made for a hard and low weight match. 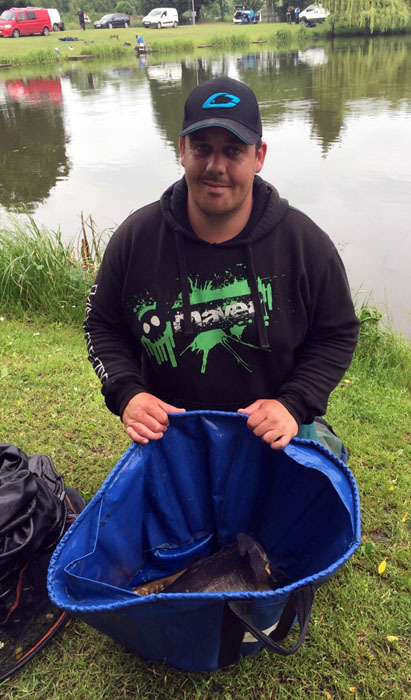 Dave Burley with part of his match-winning catch which sees him through to this year’s big money Grand Final at Hayfield Lakes. Given his knowledge of the venue, Dave will be one to watch! Winner on the day and making his way through to the September final was local rod, Dave Burley (Cresta). Dave drew peg 29 on Adam’s – a peg Dave knows all to well having qualified for the 2016 Mega Match This Grand Final from the exact same peg! Opting to fish similar tactics, Dave offered 8mm banded pellet on the long pole whilst regularly feeding 6mm pellets over the top to catch steadily throughout the match to finish with 114-02-00 of carp to 12lbs. Dave will now also fish this year’s Maver British Pole Championship final. Finishing close behind was fellow Maver Hayfield Lakes regular, Steve Clegg. Steve drew end peg 57 on Adam’s and fished down his edge at 11.5 metres at the bottom of the slope feeding 6mm pellets and using an 8mm banded pellet on the hook. Steve found carp 10lbs to finish with a weight of 111-10-00 to finish agonisingly short of qualifying for this year’s final with a single lost fish being all that separated the top two on the day. Steve qualifies for the Maver British Pole Championship final for his efforts. Finishing in third place on the day was Peter Eastwood. Peter secured an overall lake win from peg 19 on Island lake offering 83-04-00 of carp to the scales at the end of the five hours. Peter fished a method feeder to the island and, later, switched to the pellet waggler alternating between 6mm and 8mm hookbaits on both methods to find carp to 12lbs. Peter also books his place in this year’s Maver British Pole Championship final on Sunday 19th August.